~ Love one another with all your hearts. ~ Give more than you take. ~ Don't ever take your relationship for granted. ~ Have heart-to-heart talks and really communicate. ~ Be trusting, playful, intimate and kind. ~ Appreciate all the little, special things. ~ Recognize that time spent together is a treasure. ~ Make the most of what each day brings. ~ Know that nothing is sweeter than the warmth of one hand within another. ~ Walk together in the direction you want to go. ~ Be supportive and sharing and open to changes. ~ Always continue to grow. ~ Cherish this blessing which so few truly find. ~ Have dreams to reach out for through the years. ~ Share one another's smiles through the good times. ~ Be everything to one another through the tears. ~ What your time together lacks in quantity, make up for with quality. ~ Call to say "I love you" in the middle of the day. ~ Keep your sense of humor and hold on to your hopes. ~ Don't let work or worries get in the way. ~ Make love a sanctuary and a celebration. ~ Make each moment more precious and each season more glad. ~ Realize how lucky you are to be two. . . together. ~ And make the best memories any two people ever had. 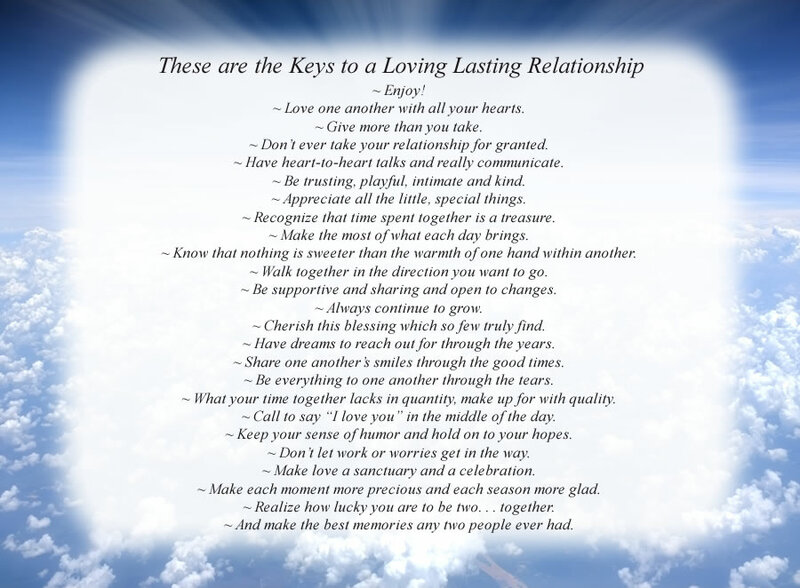 The poem, These are the Keys to a Loving Lasting Relationship, is free and printable by opening or downloading using one of the three links below.